So this book took me super long to finish reading! I just didn't find it so fun. There was one part somewhere in the middle that it really caught my attention and I really got into it, but I quickly lost interest in it and completely forgot about the book. The most interesting to me that I would say was the way the characters acted and spoke. It just so different from me. It was quite hard for me to relate to it. I suppose that's why I didn't really like it as much. So, the characters. Sarah... She really really annoyed me. She's so mean to her mom. She made her give up Cauliflower! If her mother loves him, then why would she do that?! I just don't get it. Ann seems so weak and she can't stand up to her daughter. Her daughter seems in charge. Take charge Ann! Don't let Sarah boss you around. But don't end up hating her like that Ann. You know you let her take charge. You could have picked him! You could have! But you let her get in the way of your happiness. I know. Family first. But look at her. She moved away like so fast. It was pointless. Richard. Dear, dear Richard. Why? Why'd you let her do it? Why'd you give up on her. You're so sweet and gentle. You were right for Ann. But you let her choose Sarah. So basically, the all did pointless things and that really annoyed me. So I'm giving this book a two. Does this book reach my high expectations? Nope. It just didn't do it for me. Would I recommend this book? And to who? No not really. I really didn't enjoy this story. Sorry. It is too bad that this one was a disappointment. I haven't read Agatha Christie in a long while and have not read this one. New follower through the GR Group. Looking forward to your posts. Yeah. Thank you for reading. 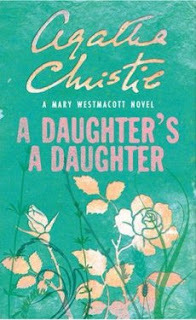 :) This was my first Agatha Christie book that I read.